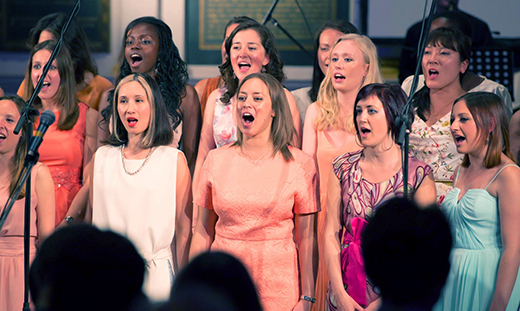 The City Academy choirs are some of the most exciting vocal ensembles in London, and welcome singers to join them throughout the year. These groups are perfect if you want to sing with friends, or get involved in a brand-new social activity. We have six choirs: three mixed-repertoire choirs (Collective, Singers and Vox), a pop and indie choir (Amplified), a musical theatre choir (Encore) and a ladies-only mixed-repertoire choir (Songbirds). All choirs rehearse weekly and perform throughout the year. If you're interested in joining a choir you must attend a taster class. This an informal audition session where you will take part in a choir rehearsal, enabling you to meet group and give the Musical Director a chance to hear your voice and assess your suitability. Joining a choir is a great way to sing regularly, learn a wide range of repertoire and meet lots of new people. Our choirs are led by professional Musical Directors, who lead our choirs in learning exciting musical arrangements for showcase and concert performances each year. Get Creative - Singing in a choir is a great way to express your creative side. Kick those work blues - Get the endorphins lift, reducing stress and giving you more positive energy. Socialise & Harmonise - Have fun and share your love of singing with new like-minded people. Beats the Gym - A physical workout. Singing increases the amount of oxygen in your blood. Gain Confidence - Performing in a group helps you overcome nerves and build confidence. City Academy Vox Choir are an exciting new choir based in East London. Join Encore and perform your favourite show tunes. Kat's trust in me and her encouragement for me to really push myself even if I go wrong has done wonders for my confidence. Learn and perform songs that you love with our choirs.